Nearly two decades ago I had left the medical device industry to jump into telecom photonics equipment. My team was responsible for the operations side of a facility that was a recently-acquired startup in the space, with a product that became so popular it created an almost immediate 12-18 month backlog. Nice problem to have, eh? I thought so, which is why I jumped. To top things off, it also happened to be located in one of the nicest small towns on the California central coast. This was no average piece of equipment. It was a large rack that could concurrently test up to 500 lasers used for long-haul fiber optic communications. Depending on configuration a single rack could cost nearly a million dollars. When I joined, the operations group was struggling to ship one unit a month, and orders were coming in a multiples of that. With just a couple of exceptions no one had worked on a manufacturing floor before, let alone a lean one. Partially-built racks were scattered around, parts were missing for most subassemblies, and a large amount of time was spent un-building racks to scavenge parts in hopes to complete one of the others. The first thing I did was institute a morning stand up meeting. We discussed and documented on a board the schedule and current status of all racks. We then spent time on 5S to reduce “lost” parts, one piece flow to get out of the habit of partially building then un-building racks, and standard work to document processes. There were many struggles and lots of educating on the sometimes counterintuitive perspective of lean. Just five months later, in March 2001, we were shipping 10 racks a month, with the same floorspace and people. The team was thrilled at what they accomplished, and they took certain liberties with the production bar chart that we would color in at each morning’s meeting. Signatures, fish tank motifs, the overflowing water when we significantly overachieved the goal for the month. I had it framed, and it has been hanging next to my desk at every subsequent position I’ve held. You can click on the image to see a larger version. Corporate management, 200 miles south, liked the dramatic change in cash flow, but never really understood how we did it. That chart is my personal monument to lean. It celebrates the power of lean, reminding me of how much value can be created in just a few short months. But it also reminds me of many lessons, lean and otherwise. You see, the month after this achievement, our customers suddenly realized that they had overbuilt long-haul fiber optic capacity. We had seen a cancellation or two in the previous few months, considered them odd anomalies and didn’t dig deeper, but then over the next couple months the entire 18 month backlog was cancelled. By August we were almost idle and hoping for orders, and on September 10th, 2001 – the day before 9/11 – the company announced that the operation would be closed and the product line discontinued. From 0 to 100 to 0 in less than a year. One lesson was that lean can create amazing improvements, but it can’t offset a lack of demand – and it’s imperative to keep a keen eye on external factors. Our leadership team, sometimes against the wishes (or even the knowledge) of our corporate parent, did things right for the employees. We negotiated significant severance, helped with job searches, and bent our ears and held many hands. It was rough, but all of them eventually landed on their feet, locally or elsewhere. Many of them went on to improve their new operations, demonstrating again that the true (compounding?) power of lean is in the teaching and knowledge of people – not just the tools. Another lesson. Monuments are interesting artifacts. Not only do they celebrate the past and remind us of lessons, they continue to teach. As I’ve continued on my own journey, new experiences add context and answers to what happened in the spring of 2001. I’ve thought about how valuable it would have been to know about Training Within Industry – TWI – during those days. 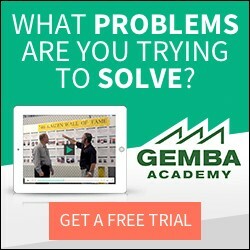 Coincidentally, Gemba Academy has just released a series of videos on Job Relations, and earlier this year released a course on Job Instruction. When I eventually got the top job at a multi-site medical device company, my monument continued to remind me of the power of people. Just looking at it encouraged me to leave the office to spend time at the gemba. Reporting to our board of directors I was reminded of how, back in 2001, I failed to educate my offsite corporate boss on how lean enabled the success of our photonics operation – and I took a different path. Today my monument reminds me of the fragility of improvement, the importance of focus, and how critical it is to go beyond the gemba to see the value of your products from the eyes of your customer. Most importantly, it reminds me of the power of people. When times get tough I’ll reflect on my monument, conveniently only a couple feet away, and often see an answer. Or at least realize that if I made it through those crazy times, I can make it through this one. What are your monuments to the journey? How are they still helping you today?